Inspector Akane continues to focus on her investigation of the strange message left at the previous crime scene and by meeting with other characters who may or may not have relevant information to the case. Inspector Aoyanagi meets with Ginoza about what it means to be an Inspector before receiving a surprising phone call. The episode begins at Kamui’s secret base, where a captured Inspector Shisui, now minus an eye courtesy of Kamui, is forced to listen to Kamui explain his ability to clear a person’s HUE and thus, end their fears. Meanwhile, members of Division 1 collect evidence for signs of a break-in in Akane’s bedroom after the discovery of the initials “WC” carved into her bedroom wall. Only Togane trusts in Akane’s judgment that the culprit might actually be someone from outside the Sybil system. Inspector Aoyanagi visits Ginoza and the two have a conversation over drinks about what it takes to be a typical Inspector and whether or not she is suitable for the job, based on her past events. Immediately after Aoyanagi departs, she receives a mysterious phone call from the missing Inspector asking her to meet at a hotel lobby. While Akane and Mika report to the Chief on the latest case, Mika is asked to leave and the Chief informs Akane that Togane actually has the highest Criminal-Coefficient but for an unknown experimental reason, Sybil has chosen not to official record it. Mika, slighted by being dismissed, strikes out on her own on a new case and arrests a politician which reinforces her belief that she is doing the right thing despite her earlier feelings of uncertainty. The episode concludes with Inspector Aoyanagi visiting a hotel lobby to meet whomever it was that sent the message from before. Instead of waiting for back up and to avoid issues with Enforcers, she goes inside and encounters an old man who becomes agitated and attempts to harm a hotel employee. Aware that something is strange, she checks her Dominator only to find the old man's Criminal Coefficieent too low for him to be considered a target, regardless of his violent actions. As the man rants about Kamui, Aoyanagi is attacked by the old man's robotic dog which knocks her down and sends the Dominator flying out of her grasp and sliding across the floor to the gasp of onlookers. Frozen in horror, Aoyanagi finds herself incapable of stopping the criminal. Many thanks to Atreides who helped me organize my post. I will probably write up on the previous episodes just for completion's sake later on. Any comments or advice would be appreciated as I've never written online before other than for comments on blogs. Thanks for posting more current anime for discussion. I really liked discussing Aldnoah.Zero. I haven't seen this show yet, but I'm going to watch the first season before jumping in this (unless the first season isn't too related to the second - I'm avoiding reading anything about this for now, because folks were pretty fond of this show). Personally, I don't think you need to do much write-up for a FanFare post and I save my lengthier thoughts for the comments, but others spend more time with the initial post. 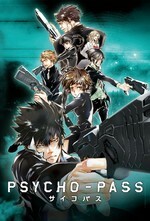 There's actually a Psycho-Pass Extended version meant for anyone interested in S1 or looking for a refresher before S2. I read it does a good job of keeping the main events intact and adding small scenes from the novel too. Although, I didn't watch it and I'm referencing from my past exp w/S1 and from wiki summaries. I don't see many anime posts here and for awhile I was uncertain if it'd generate any interest since it could be too niche. I'm not a huge fan of S1 but I'm mostly watching because I like Akane and I want to see her personal journey continue as a Inspector. It's one of those series where I find the cast more compelling than the actual plot/events going on. Oh, thanks! I'll look for the extended version. And I know what you mean about characters who are better than the plot. Because there aren't many anime series being posted, I'll stick it out with anything that anyone posts, as long as it's not completely awful or beyond my viewing preferences (no super candy-sweet shows, unless there's a suitable dose of sarcasm or darkness, nothing graphically violent for the sake of violence, but most anything in between works for me). I know what you mean wrt to anime series after being in this hobby for awhile there are many shows I don't follow because I dislike the story and/or character designs. Although, P-P Is a moderately violent show just a fair warning nothing beyond PG13 and nothing as bad as AoT. I greatly dislike shock/gore story elements so I'm nitpicky about shows. I'm also in the boat of having to get caught up with the first season of Psycho-Pass before I can start commenting on the current series. As for anime posts on FanFare, my experience with Aldnoah.Zero (and reading other anime posts) has been that it's probably best to not make a lengthy super-detailed post. You have to leave something for people to bring up themselves in the comments, and if you cover everything in the post then there's not much left to do other than read. Also, as filthy light thief says, leave the lengthy thoughts for comments. I was trying to gauge interest in following Fall 2014 anime in this FanFare Talk thread, although now it seems to have become more of a thread on Fall 2014 anime in general. If somebody other than myself expresses interest in a series I am currently following I will start posting. Just let me know in the FanFare Talk thread. Thanks for suggesting the Psycho-Pass Extended version. I've watched 3 of the 11 episodes, and I'll finish it up in a week or two. So far, it's pretty good, and I'm enjoying the plots about as well as the characters. chrono_rabbit, feel free to post more episodes of PP s2 as they air, as I'll be up to speed shortly. I'd think that if coming across someone doing physical harm to another individual without having a sufficiently high Crime Coefficient for the Dominator to even stun the person, an Inspector would take it upon themselves to save potential victims from further harm by engaging the perpetrator physically, at least pistol-whipping them with their GIANT USELESS GUN. Perhaps if technology has reached the status of being 99.9999% operational, glitches or outages are so rare that technological solutions are assumed to be best in all cases and no one has a "low-tech" backup.